Since each armor is made per order, we are always happy to consider custom modifications to the standard armors we offer. You have the opportunity to choose your options from our extensive options list. Please contact us if you have any questions or requests, as we are here to take care of you. Our armors are designed to fit average Japanese adults up to 175cm (5 3/4'), with up to 100cm (40") chests. If you need a larger size (or smaller perfect fit for your Dojo practice/movie shooting), we would be happy to offer you our custom sizing service to ensure a perfect fit. A slight fee (between 10% and 40% of the listed price) may be charged, depending on your measurements. It will take 1 to 2 additional weeks to complete a custom sized suit of armor. We need to get your key measurements such as height, chest girth, waist, head girth and the length from your fingertip to base of the neck to complete the custom sizing. Please refer to the chart that figures which measurements on your body would be required for the custom sizing. Please be advised you should provide as many measurements in the chart as possible to ensure the perfect fit. 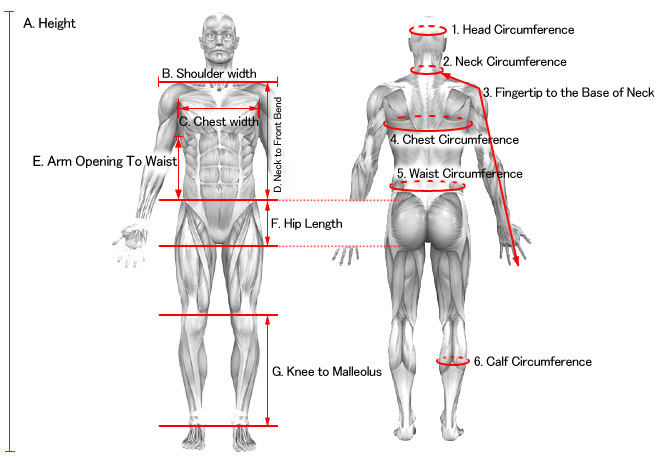 To accept your custom sizing request, we need at least 5 key measurements from the chart below - (A) height, (1)head circumference, (3)fingertip to base of neck, (4)chest circumference, (5)waist circumference. We would be happy to provide you with the option of changing color scheme of the lacquer finishes and/or braid lacings of your armor. If we carry the color you want in our stock, the change is free or a slight fee would be charged. *Please note that these colors displayed on your computer may differ slightly from actual color. A number of traditional Japanese family crests can be added to your armor's chest and/or the storage box for free. You can choose your favorite samurai crest from our list. Custom graphics including a western style crest and company logo can also be crested for a fee. Check out the list of samurai family crest we have in our stock.